Plus up your breakfast with Total® Plus Omega-3's cereal! 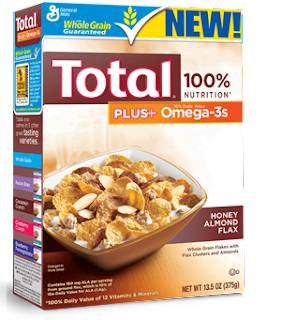 All the nutrition of Total®, plus a good source of Omega-3s and a delicious honey, almond crunch. Now your tasty bowl of Total® cereal is even better, with crispy whole grain flakes, honey-sweetened almond, and crunchy flax clusters. It's a great way to start your day - every day! Omega-3 fatty acids play an important role in helping to maintain a healthy body. There are two types of Omega-3s, short-chain ALA and long-chain DHA and EPA. More than 50% of adults don't get the recommended amount of ALA. Total® Plus Omega-3s provides a good source of Omega-3 ALA from ground flaxseed, a natural source of this essential nutrient. The recommended Daily Value for ALA is 1.6 grams. Total® Plus Omega-3s cereal contains 160 mg of ALA per serving from ground flax, which is 10% of the Daily Value for ALA. Eager to try Honey Almond Flax by Total, I decided not to wait until the next morning, and the kids and I had a bowl as an afternoon snack when it arrived! The sweet crunchy flavors, and slivers of Almonds made for a wonderful treat! What totally won me over about this new cereal? THE KIDS LOVED IT .....and it's healthy! For a sweet morning treat, that will start your day off right, check out the Honey Almond Flax by Total! 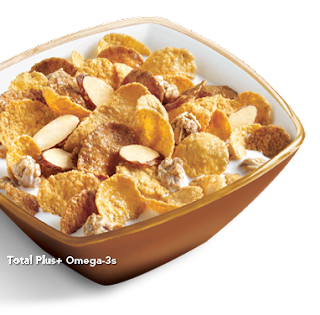 You can find Total® Plus Omega-3's Honey Almond Flax Cereal at a grocer near you! Don't forget to PRINT YOUR $1.00 OFF COUPON HERE. Want a yummy treat to start your day off right?! One Lucky Reader will receive a Total® Plus Omega-3's Prize Pack! Includes: Box of Total® Plus Omega-3's Honey Almond Flax Cereal, a Total Cereal Bowel, and a Total Spoon! Leave a comment~ Which Total Brand Cereal Flavor do you love?! The comment is considered your entry. Hello, I'm a public GFC follower and my favorite Total flavor is the Cranberry Crunch. Thanks for a great giveaway! Just for the record. High sugar meals, like this one with cereals, are full of sugars (carbohydrates are sugars) that send you blood sugar to the sky. High blood sugar produces several health problems like obesity, chronic inflammation, high triglycerides and cholesterol. You would do better with a high protein breakfast. I gotta go with the Total Cranberry Crunch! Yum! I like the Cranberry Crunch best as well, thanks! I'm a follower. I love the blueberry pomegranate total.